Today I want to share a very special recipe for me and my family. This recipe reminds me how beautiful life is and how amazing my Grandma is. In a small bowl put the stale bread and cover with lukewarm water. Let soak for 30 minutes then squeeze out the excess of the water. In a large bowl combine ground beef, chicken, squeezed bread, prosciutto cotto, mortadella, parmesan cheese, parsley, 1 egg, salt and pepper. Blend all the ingredients very well with your hands. Shape into golf-sized balls by hands. Roll them into bread crumbs. In a large skillet pour the olive oil, and when is really hot fry the POLPETTE for 5-7 minutes or until golden brown. With a skimmer, remove the POLPETTE from the skillet (one at the time) and arrange on a plate covered with paper towel. 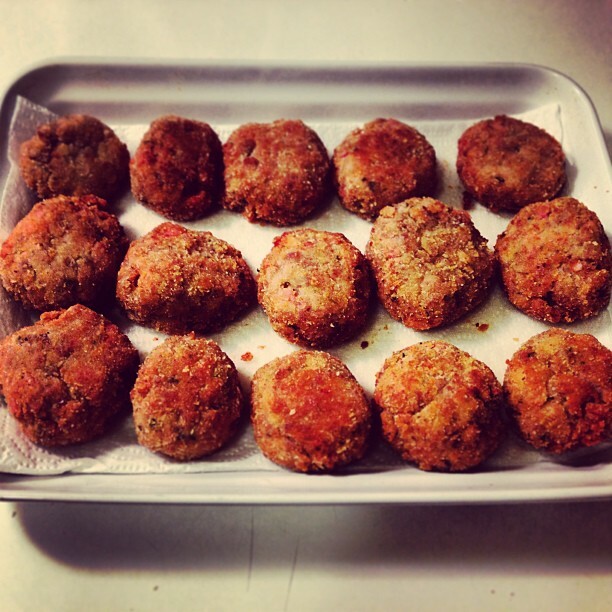 The Polpette are ready to be served with a side of fresh green salad tossed with EVOO, Balsamic Vinegar, salt and pepper. …as always SIMPLE & DELICIOUS!! !